When historians look back on the Trump presidency, they'll say that last week was the moment something changed -- the week when uncomfortable questions about Russia moved into the mainstream in a whole new way. Trump's odd behavior with Russian president Vladimir Putin got people talking last Monday, when the two men met in Helsinki, and the criticism continued all week long, evincing deep concern about the relationship between two of the world's most powerful men. And if Helsinki was fresh kindling for a raging fire, Trump poured even more fuel on it Sunday night. With the click of a button, he tweeted that "Russia" -- shorthand for the Russian interference campaign in 2016 -- was "all a big hoax." Now the White House press corps -- and members of the public -- have even more questions for the commander in chief. But it is shaping up to be another week filled with questions about Trump's loyalty. So President Obama knew about Russia before the Election. Why didn't he do something about it? Why didn't he tell our campaign? Because it is all a big hoax, that's why, and he thought Crooked Hillary was going to win!!! "It's bewildering, why the president would go back and call this a hoax," veteran political analyst David Gergen said on CNN. Trump has given lip service to this assessment, saying he accepts the intelligence community's conclusions, while acting like he does not. Most of the times when reporters have shouted questions to him in recent days, he has declined to answer. So he's done most of his talking in tweet form. He continues to claim regularly that the Robert Mueller investigation into Russian interference in 2016 is a "witch hunt." Numerous Trump administration officials say it is not a "witch hunt." They also say the Russian effort is ongoing. To be clear, Trump's director of national intelligence Dan Coats says yes. Coats recently said it was "undeniable." But when ABC's Cecilia Vega asked "Is Russia still targeting the US, Mr. President?" Trump responded "Thank you very much. No." Vega was one member of a small press pool that was allowed inside the beginning of a Cabinet meeting. When Trump said "no," Vega followed up: "No, you don't believe that to be the case?" Trump was again heard saying "no." News outlets sent out breaking news alerts. But then Sanders claimed he was saying "no" to answering questions from the press corps. This explanation made little sense because, after he told Vega "no," Trump continued fielding questions from other reporters. So there's ample reason for journalists to try to ask again: "Is Russia still targeting the US?" 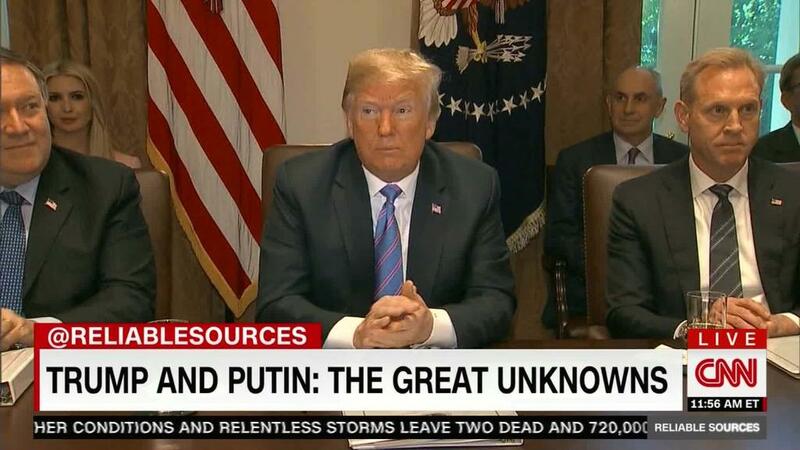 With regards to Trump's treatment of Putin and Russia, national security experts and journalists have been citing the fact pattern and saying there's something strange going on. "No rational president would act this way if he weren't being blackmailed on some level," Republican congressman turned MSNBC host Joe Scarborough commented. Scarborough has been harshly critical of Trump for more than a year. Josh Marshall of Talking Points Memo, a liberal-leaning website, wrote that Helsinki "made cautious, prominent people start to come to grips with the reality" that Trump is "under some kind of influence or control by a foreign adversary."